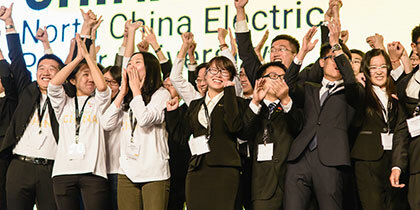 For the teams competing today, the start of the Opening Round of Competition was an opportunity to celebrate the past year, one filled with hard work, determination and passion. More than a year ago, these students came together and made their plan. They saw a unique opportunity, executed their projects, and were encouraged by every life they touched. 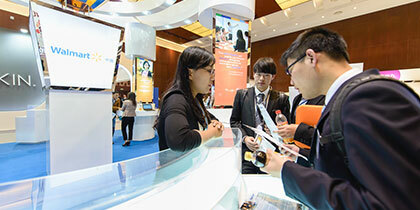 They prepared for competition, decided which initiatives to present and the best way to communicate it all. 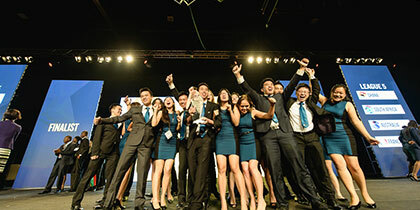 They had the courage to stand up in front of leading business executives, in some cases numerous times and on really big stages, and do their best to tell their team’s story. And they had the privilege of being named their country’s national champion, earning the chance to come to this event and tell their story once again. What amazing things these young people have accomplished and their actions show us that the world is truly ours – we congratulate you and we are proud of you. While the competition was going on, 12 of our generous supporters participated in the World Cup Sponsor Fair, where event attendees had the chance to learn more about the individual companies and interact directly with their representatives. The time and effort these companies invest in the event is substantial and we are grateful to have such tremendous support. Next came the Top to Future-Top Forum, always a favorite part of the World Cup experience as it brings together the top leaders of today and tomorrow to learn from each other through discussion and exploration of relevant topics. Our generous Host Country Sponsors facilitated breakout sessions that covered topics their company is passionate about: Coca-Cola shared their thoughts on sustainability efforts; Chow Tai Fook explored building a youth brand; Unilever discussed sustainable living; NU SKIN focused on corporate culture inspiring talent; Walmart looked at acting with integrity; Cargill discussed food security; and KPMG focused on leading with purpose. 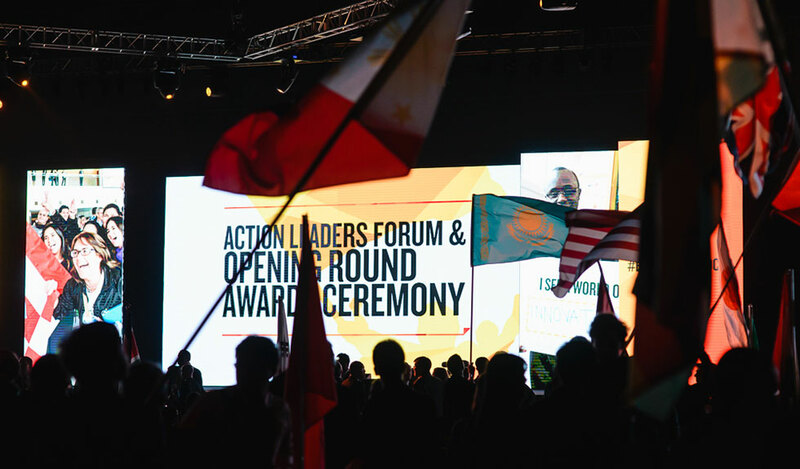 Everyone then came together in Plenary Hall for the Action Leaders Forum and Opening Round Awards Ceremony, which started with the Parade of Nations followed by a riveting discussion moderated by Lord Dr. Michael Hastings, Global Head of Citizenship, KPMG International. Doug McMillon, President and CEO of Walmart Stores, Inc., William Wang, Founder and CEO of Vizio, Tom Gorman, CEO of Brambles, and Roza Otunbayeva, Former President of Kyrgyzstan each offered their viewpoints on a variety of important topics including food security, technology, women’s empowerment, and the opportunity for individuals to make a difference. They also took questions from the students in attendance. 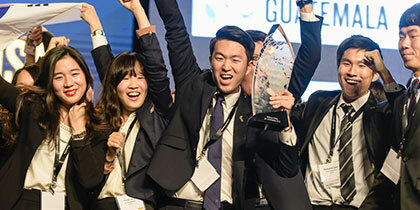 There are too many great points and interesting thoughts to share here; you need to watch it for yourself at enactus.org/worldcup. Before the semi-finalist announcements started, Kees Kruythoff, President of Unilever North America was presented with the Global Champion Award, our highest individual recognition – we are incredibly grateful for his support of and involvement in Enactus. With much anticipation and emotion, our 16 semi-finalists teams were announced next, leading to cheers and a few tears. Be sure to watch the ceremony later today so you can see for yourself; it is such an exciting process. KPMG facilitated the timeslot drawing and the teams picked their leagues and times. You can find the league assignments and the competition results on the World Cup site. You can also find information on how to download our mobile app there; if you’re not following along with us, you are missing some great posts and pictures from the students in Beijing. All is quiet at the China National Convention Center now, with the semi-finalist teams returning to their rooms for one last practice session and the others celebrating their performance today. Today’s events were a poignant reminder of what can happen when, in the words of Tom Gorman, we decide to be ourselves, get involved, and make the world better.